Connection at startup to google-analytics and doubleclick.net? 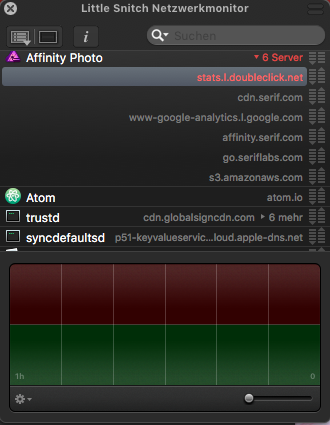 mh, why does Affinity Photo try to connect to doubleclick.net and google Analyics? What information is shared with doubleclick.net? Can this be disabled? This will be the Start up Panel that shows when launching Affinity. It shows the latest Affinity news, samples and links to our videos. If you untick "Show this Panel on Startup" it should stop the connections. I was thinking of starting a new topic about a similar issue, however as my question is of a similar nature, I think it would probably be better to post it in here instead. Even after turning off "Show this Panel on Startup", Affinity Photo still tries to make outbound connections to crashes.seriflabs.com and s3-eu-west-1.amazonaws.com every single time Affinity Photo is started. I appreciate that telemetry is invaluable to you and helps you to improve your products, however I would like to disable telemetry/automatic update checking. Therefore, please can you advise on how to disable this from within Affinity Photo? One of the devs talks more about this here and the possibility of adding an option to disable it.